Nice pat on the back to start off 2019! Thread: Nice pat on the back to start off 2019! I wasn`t sure if I should post this but I couldn`t help but share. So it`s no secret that I am a authorized IGL coatings installer and have been since 2017. Since then my business has grown and 2018 was very very busy. Especially since I`m a one man show. But I definitely couldn`t have done it without all of my clients, family, friends and detailing family. 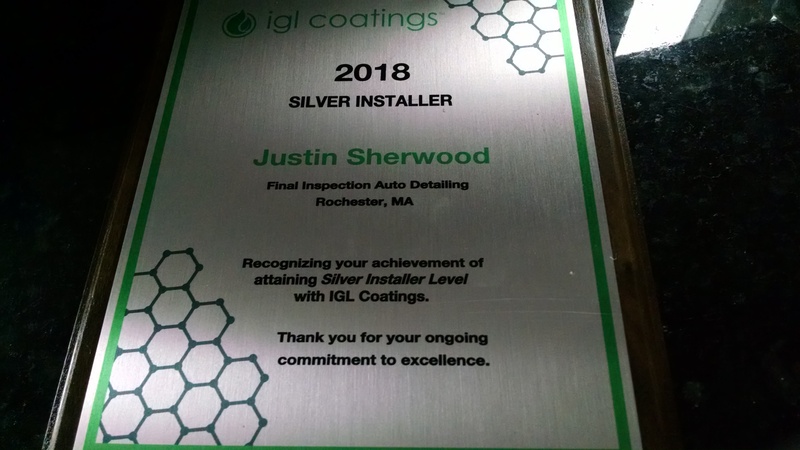 IGL likes to recognize installers every year for there hard work and to my surprise I was recognized as a IGL silver installer for commitment and excellence. It`s definitely an honor considering there is over 500 authorized IGL installers between the USA and Canada. And only 45 or so made it to silver installer. 9 made it to gold and there was 1 platinum. Now I have something else to display on the walls of the shop! Re: Nice pat on the back to start off 2019! Great job, Great work, Justin Sherwood !!!! I am so proud of you !!!!!! Thank you for all that extreme, detailed, labor of love !!! Your Clients, and We, are all so happy for your recognition and award.. They should recognize you. Your a loyal full line dealer what puts out a stellar result with their top of the detailing industry products. Igl is a class act as are you. The igl stuff never stops impressing me. Anyone start this crazy trade back in the 70s?